Published July 2, 2012 , Oceanview Publishing. 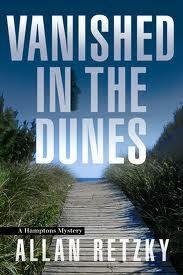 Vanished In The Dunes by Allan Retzky is a mystery set in the Hamptons, about a married man with a weak marriage who becomes involved with another woman. The plot is predictable and contrived. I didn’t feel an emotional connection to any of the characters, who seemed two-dimensional. The male protagonist makes decisions that aren’t plausible. I’d recommend this book for light summer reading.